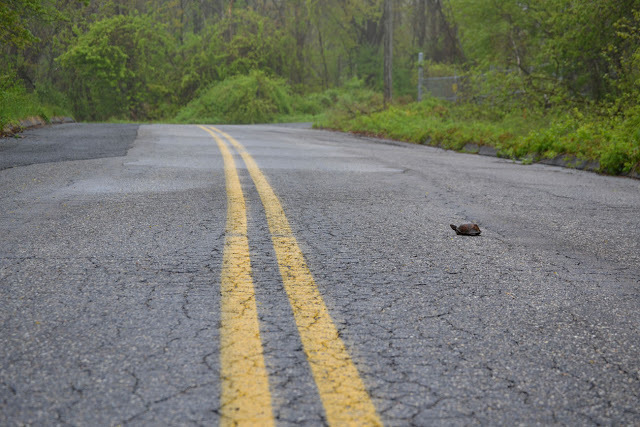 Today I met a turtle crossing the road. I didn't see it until I passed over him. As I looked in my rearview mirror, I saw its little legs and head tuck into its shell. Remembering that my sister once, too, helped a turtle cross the road, I figured I should try and do the same. I turned around, picked him up and placed it on the grass in the direction it was heading. And as I got in my car to drive away, I felt as if God was saying, "Imagine doing that, but for people....helping them cross roads." If you read my post a couple weeks ago, you'll know I have been trying to rebrand myself to encompass my full offerings. Essentially, I was trying to "find" my value. My search ended after realizing I AM my value and all I ever needed was to believe in it. At some point, we are all coming out of our shells to cross roads into new territory. And sometimes, we just need a little help. And it's okay to need help! Another interesting thing about turtles? When they need help crossing somewhere, it's SO important to keep them facing the same direction and not to turn them around from where they're coming from. It's the same with people. That turtle knew what he wanted and he has enough gusto to go for it even forsaking his safety and comfort. He faced his fears and left what was familiar behind. He inched his way to a new story - one of greener grasses, running waters, and maybe even more turtles. I've always been more than a writer, more than a marketer, more than a content strategist -- I'm walking into my greater realm of consulting as The Storyspeaker who is helping brands and individuals speak their stories in ways they've never imagined, so they can be more than they've ever dreamed! I am not sure what you've been through. I don't know what you're enduring now, or what you're waiting on, but I know this - your story is not what you think it is. What story are you telling yourself and to others? What childhood are you replaying? What role are you living? Most importantly, what lessons are you learning? Of course, we can't ever change our past, but we can predict our future by changing how we think about our past and changing what we do in the present. If you're reading this blog and are thinking, "Caitlin, if you only knew what this person did to me..." or "Caitlin, if you only knew what I have been through..."
Do you know something I realized recently? It doesn't matter what you've been through. It doesn't matter what anyone else did or said. You are more powerful than what happened to you and more courageous than anyone who hurt you, and what matters more than anything else in this world, what has already given you victory in the face of every disadvantage and wrong, is your knowledge of self. Every heart has its unique pains which no other may be fully able to comprehend. But each of us can empathize with our sufferings because we all have a human experience. If you are letting your past or your circumstances, or anything else besides what is meant for you, define your story today, it's time to retell history. If you're seriously struggling with mindset in any capacity, you, your environment, your past - neither of these are the issues. If you don't like your story, it is because you are not reading it for all it's worth, and more importantly, it's because you're limiting yourself to a version of a story that is not even a fraction of who you are and what is meant for you! My dear subscribers (future and present), I want to know your story! What direction are you moving towards or even thinking of heading? Message me and let's set up a call to talk about your story. No strings attached, no sales pitch. Just an open ear and heart.